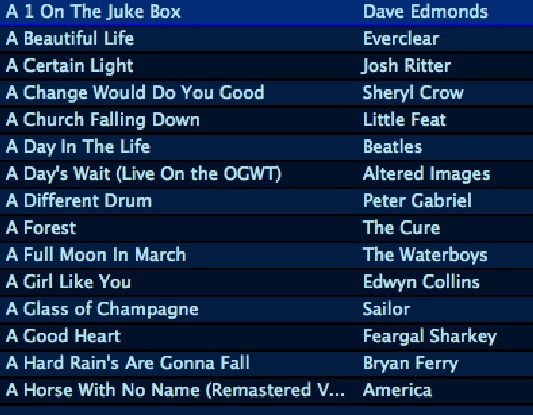 Here is the tracklisting for episode 4 of An A-Z of Great Tracks, live broadcast January 15th on 8Radio.com and due for repeat on Saturday 18th January 2014 from 10-11am. Four weeks in, we’re now crossing over from the tracks beginning with the simple word “A” by itself, and into full words beginning with A – and Abacab has the honour of being the first proper A-word track to be played. Between the two there is a little oddity in the form of A-Punk from Vampire Weekend. I wondered whether I should have moved this up and treated it as if there was a space rather than a hyphen, but in the end a bit of research showed me that the hyphenated version of the title seems to be pretty universal. 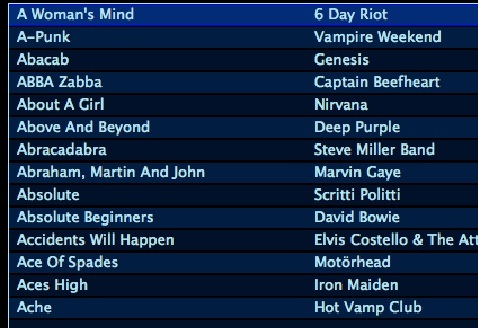 That’s one thing about compiling this show – it’s helping me do a top to bottom tidy of my music library, correcting any titles that are misplaced, mis-spaced or otherwise out of sync with reality. An example would be “A Whiter Shade of Pale” which closed off last weeks show – I wondered why I couldn’t find it in the As as I knew I had it, before finding that it had been mistitled as simply “Whiter Shade of Pale” when I copied it from my physical library a number of years ago. 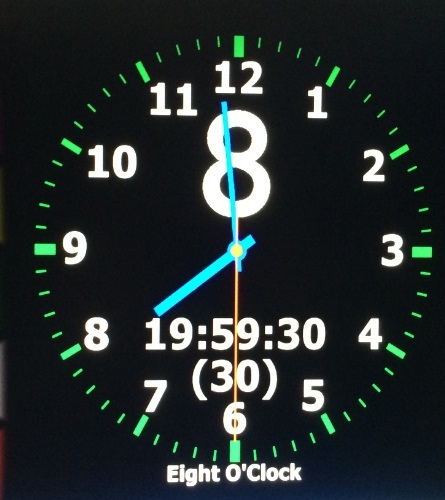 And so, the As proper begin – and continue until around the end of April, by my calculations! 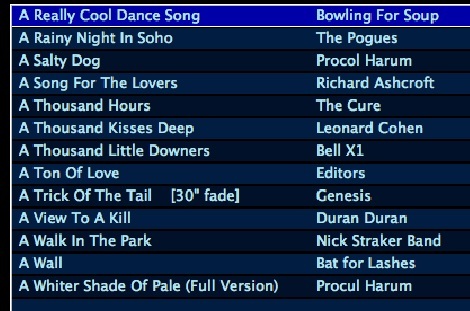 Here is the playlist for the second episode of An A-Z of Great Tracks, and there are a couple of entries here that I thought long and hard about before settling on the final list. 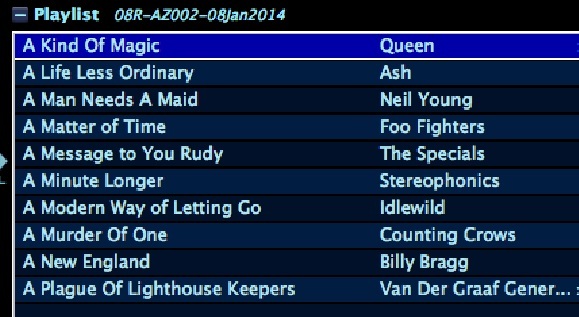 The show aired on Jan 8th 2014 on 8Radio.com, in its regular weekly slot – 8-9pm Wednesday evenings. So, the second show of the series, and we are still wending our way through the very beginning of the letter A, those tracks who titles start with the word “A” – we’re not yet even up to actual words beginning with the letter a, which is a week or two away. 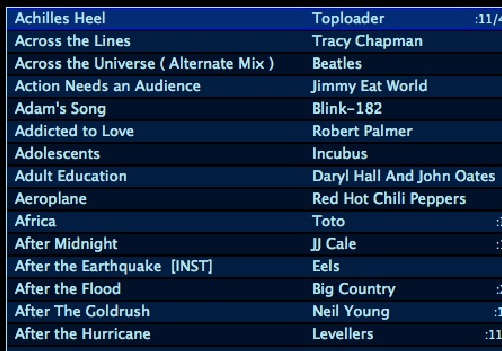 I’ve pretty much settled the running order for all my A tracks – 16 weeks worth – but as always with live radio, I will sometimes make changes at the last minute based on mood or feel, or, in this case, balance (As the programme was airing I added in the Foo Fighters track to provide a bit more contemporary rock, as otherwise this hour would have been very heavily retro – it’s usually more balanced, but the luck of the draw means that you will tend to get clumps of older or newer tracks together from time to time. And as a result of this, a track that would have finished the show got pushed into next week). A couple of tracks in particular gave me pause for thought when I was compiling the list, and in both cases, I eventually went with my heart over my head. The first was “A New England” – a track originally written by Billy Bragg, but made famous by Kirsty McColl. Now, I adore Kirsty McColl, and her work will feature a number of times in this marathon trawl from A-Z. And I loved her version of this track, which is, to all intents and purposes, the “standard” version as far as most people are concerned. But the Billy Bragg performance is so powerful, and the lyrics written by Bragg seem – to my male mind anyway – to resonate more powerfully when sung as a male lamenting an uninterested girlfriend, than in the reverse. And the copy I have of Bragg doing this track is acoustic, and really, really punchy. So the lesser-known Billy Bragg recording won out in this instance over the more normal “hit” version. There are going to be many more such decisions to be made as I go through the A-Z and come across tracks recorded multiple times by different artists – which version to choose? The musically significant or the hit version? original or cover? I think my decision will be made in the same way each time – referring to my heart and listening to how each version makes me feel. because that, for me, is what elevates a track from “Good” to “Great”. The other hard decision was whether or not to include the 23-minute long prog-rock classic “A Plague of Lighthouse Keepers” in a one hour radio slot. Here again it was heart against head. My gut instinct is that this is a brilliantly devised and performed masterpiece of rock from an era where tracks which occupied an entire side of an LP (as this did) were, if not the norm, at least a regular feature of the music scene. Van Der Graaf Generator are a hugely regarded band, still recording and performing today, and this track in its entirety forms an important part of their stage show. For the music head in me, the track is a definite yes. However, with my radio hat on, I worry about the wisdom of including a track whose running time takes up more than a third of my entire slot. It’s only the second show in the series, do I want to scare potential listeners away with a very long, complex and obscure piece of music? It would be different if the show was well established, but on the second week . . But that last point is a fallacy. it shouldn’t matter where in the run of episodes it crops up – the question is, does the track merit playing? 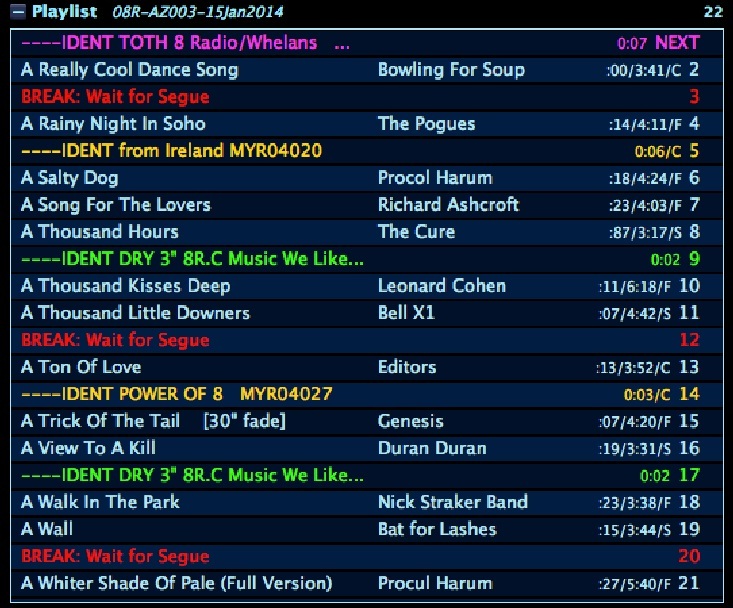 Mainstream radio would never play it in a thousand years (outside, perhaps of a specialist slot). And that itself is an argument for me to include it – I’ve been on the outside, breaking down the walls of mainstream, and transgressing its limits for the whole of my radio career. Ultimately, it is back to my emotional, gut reaction – this is a truly epic track, a “great” piece of music if ever there was one. And so into the A-Z of Great tracks it went. One of the greatest things about producing this series, by the way, is the fact that all of the above discussions take place entirely inside my own head, and I don’t have to seek approval, or run any of this past anyone else. 8radio.com have faith in me to do it my way. My show, my playlist, and 100% my own decisions . . which is really “great” also! You can catch An A-Z of Great Tracks every Wednesday evening 8-9pm on 8Radio.com.